I have a question. Can frost kill pixie lillies? We bought some beautiful orange pixie lillies from Lowes about 2-3 months ago. We put them into a large planter with plenty of room, gave them the best potting soil, and even added some miracle grow. They bloomed for about 2 weeks if that, and nothing since. The leaves look tremendous, very green and beautiful, but I cannnot get anything else to pop up. I have never had this type of flower, so I wasnt sure if they only bloom once. I live in Houston, Texas, they get sun and shade. Also, we even cut back one stem, to see if that would help, but nothing. I bought a Pixie Lilly about a month ago & have it inside in a pot. It was doing great..until my young son threw a towel across the room & broke it off. It snapped leaving the roots in the bottom of the pot. I replanted in down into the same pot across from the roots. My question is..will it live & reroot? It's been 3 days & the leaves are wilting a bit but it is still green & looks healthy so far. 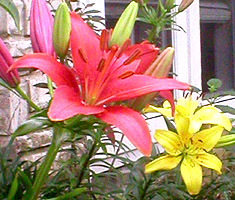 I have got orange pixie lillies which have bloomed only once how do you get them to bloom agian? as it says flowers june - august??? I also have pixie lillies in garden. All are blooming great. But I have a bleck tar like sticky solution on leaves. eating holes in leaves. How can I get rid of it. I purchased an orange pixie lily today and would like to know if I can plant it in the garden now? I live in Suffolk county, Long Island, N.Y. If this is a bad time to plant it, what should I do with it when it stops blooming?